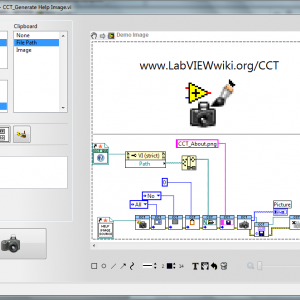 The Code Capture tool allows you easily create screenshots of you LabVIEW code for use in documentation, web-sites, wikis, emails. This tool provides an API for creating images of LabVIEW code as well a GUI for easy capturing and use of code. Further info is provided in the help-screen (F1) of the program. For more info, visit the LabVIEW wiki with the documenation. To install the Code Capture Tool, run the 'Install Code Capture Tool.vi' in the LabVIEW version of your choice, or use the OGP file in conjunction with VIPM. A wizard will guide you through the installation procedure. After installing and restarting LabVIEW, you can open the Code Capture Tool via the 'Tools' menu to capture an image of the current VI. For more info open the About screen of the GUI. In your LabVIEW data folder (in Windows, this is normally: My documents\LabVIEW Data) is a configuration file called Code Capture Tool.ini, which can be removed at any moment. However this file can be shared between mulitple versions of LabVIEW, I recommand you to use a special LabVIEW data folder for each LabVIEW version. Comments, bugs and thank yous can be expressed to the NI Forums community , and on the LAVA community at the CCT discussion thread.